Posted: Wednesday, June 20, 2018. 3:57 pm CST. By BBN Staff: Today, Belize received a grant of US $510,000 from the Republic of China (Taiwan) to support Belize’s upcoming Presidency Pro Tempore (PPT) of the Central American Integration System (SICA) from July to December 2018. The cheque was presented by His Excellency Charles K. Y. Liu, Ambassador of the Republic of China (Taiwan) to Belize to Wilfred Elrington, Minister of Foreign Affairs. 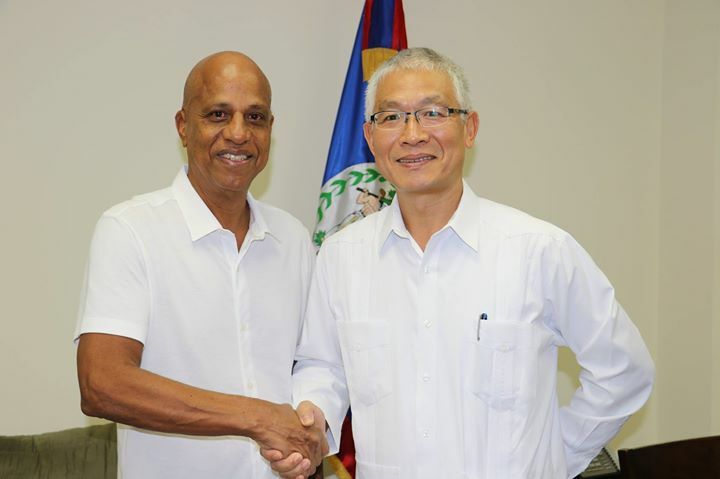 In his remarks, Elrington conveyed the government of Belize’s gratitude for this support from the government of the Republic of China (Taiwan). The Republic of China (Taiwan) has provided funds over the last decade to support the institutional strengthening of the Ministries of Foreign Affairs of SICA member countries. Belize will use the disbursement of funds for implementation of its work programme under the SICA PPT. Belize and the Republic of China (Taiwan) established diplomatic relations almost thirty years ago. The Republic of China (Taiwan) remains a committed and consistent partner to Belize’s development. The handing over ceremony took place at the Laing Building in Belize city earlier today.